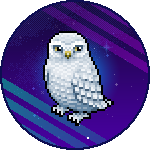 Get your very own rare Snowy Owl! Just be prepared for it to bring home mice every now and again. Available for a short time only! Last edit by WhiteBlack at 05-12-2018 15:56:03.